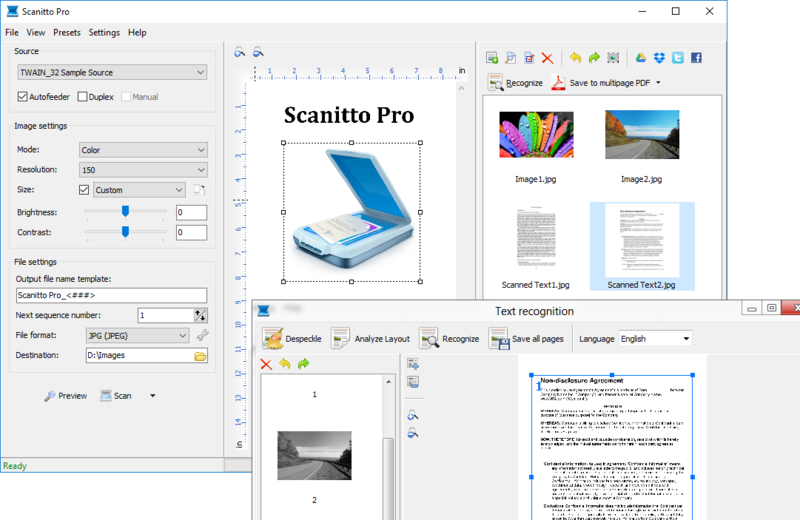 Scanitto Pro is an easy-to-use and convenient scanner software for Windows packed with cutting-edge features. Scanitto Pro supports the overwhelming majority of scanners, both mainstream and professional, and is extremely easy to configure. Scan and save your documents as PDF, BMP, JPG, TIFF, JP2 and PNG files. You can even make multi-page PDF or TIFF documents. Create searchable multi-page PDF documents with unprecedented ease. Scan, recognize text and create editable and searchable electronic copies of paper documents. Scanitto Pro offers one-click scanning and copying through TWAIN drivers, which provide exceptional scan/copy quality and speed. In addition, Scanitto Pro seamlessly integrates with Windows to provide a complete document management environment which is intuitive and very easy to use. Unlike more complex solutions aimed at purely professional use, this product is simple enough for regular users with no technical background and no prior experience with this type of software.